This blog post is part of an ongoing effort to find the best open source tool for Triangulated Irregular Networks (TINs). My SAGA installation is a bit rusty. I need to open the dataset twice ("File > Grid > Load" or by using the File System tree) before it actually loads. The first number is the cell size (100 meters), the next two numbers show the number of cells in x and y direction (600 x 600 px), and the last two numbers are the origin of the grid (my dataset is in UTM 32N). Unfortunately, the tools are poorly documented, so we need to experiment a bit. When I tried "Grid to TIN" I got (599 x 599 * 2 = 717,602 triangles for my 600 x 600 = 360,000 pixels, which is not very efficient. This is similar to the technique I used to create a triangle mesh in three.js. I'm not sure how the different methods are working, and if they can be combined by setting different thresholds below. Please give me some hints if you know some theory and best practices for terrains like this. I first used the defaults (Opposite Neighbours). 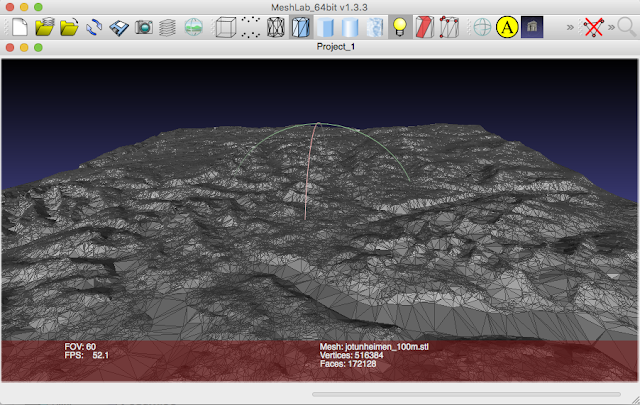 I'm not friends yet with the map/3D-viewer of SAGA, so I'm exporting my TIN so I can enjoy it in other applications. 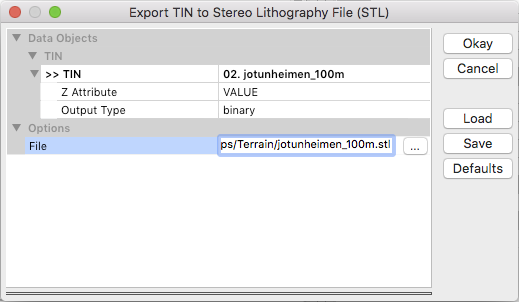 The export tool is hidden under Geoprocessing > File -> Shapes -> Exports -> Export TIN to Stereo Lithography File (STL). Ok, it's promising, you can clearly see the big triangles for lakes, and smaller triangles when the terrain is rough. I got 172,128 triangles, about one-forth of a regular mesh. But it's not good enough, as I see that parts of the lakes are not horizontal. Which settings should I use to fix it? Is it possible to run TIN functions from SAGA on the command line? Does SAGA CMD work on Mac? How big dataset can SAGA handle? Do you want to contribute to this tutorial? Please add your comments below! I use SAGA from the command line on MacOS X. I mainly use it from mu Jupyter notebooks. I also use the SAGA innstallation that comes with QGIS. The path to this saga_cmd is "/Applications/QGIS.app/Contents/MacOS/bin/saga_cmd". Append the option you want to use at the end of your command and continue from there. 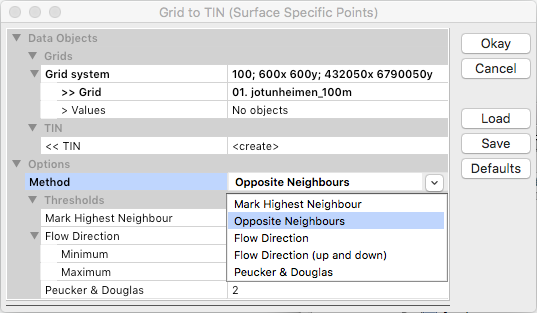 I found using 'Mark Highest Neighbour' gives me a nicer TIN, but still not an accurate representation. Now I'm wondering how to theme the outputs. QGIS does not seem to have facility to make a 3D or 2.5D representation of these outputs. Suggestions? Thanks for your work on this. SAGA is indeed powerful but not well-documented.